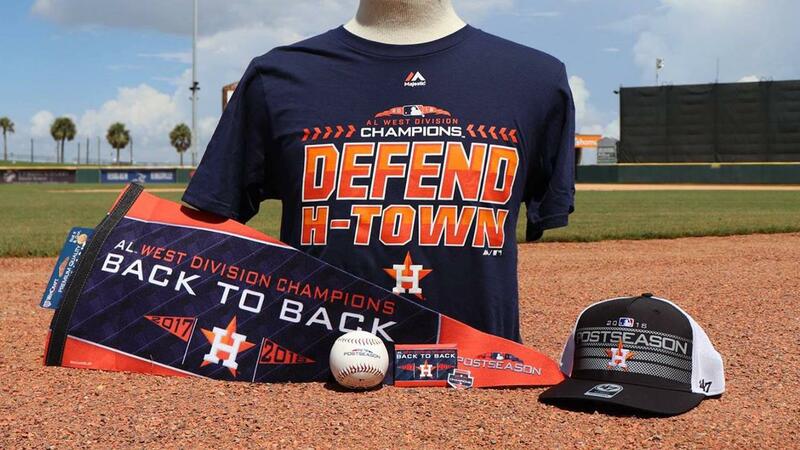 2018 Houston Astros postseason merchandise is on sale now at Hook, Line & Sinker. To commemorate Houston's pursuit of back-to-back titles, all HL&S customers who make a purchase of $50 or more will receive an Official Astros Replica World Series Ring. Hook, Line & Sinker, the official team store at Whataburger Field, is located near the Right Field gates at the intersection of Port Avenue and Tancahua. Regular offseason hours are 10 a.m. to 5 p.m. weekdays and 11 a.m. to 4 p.m. on Saturdays. "We want to make sure everyone is geared up for another Astros' championship run," Hooks Retail Operations Manager Rudy Soliz said. "Our shoppers have access to all Astros playoff apparel in the Locker Room line, including AL West Division Champions caps and t-shirts. We also have the Astros New Era adjustable hat with the 2018 postseason side patch." Astros playoff merchandise is available in-store only. Fans may purchase Hooks gear online at cchooks.com/shop. Call 361-561-4700 for more information.